I discovered the poetry of George Herbert in a university British literature class, and it was a delightful discovery. George Herbert (1593-1633) was an Anglican clergyman who wrote metaphysical poetry – poems that address the mind and stimulate the imagination. Herbert’s poems, often written in first person, focus on his devotion to and relationship with God and are very personal and reflective in nature. It is as if Herbert is baring his soul, revealing his spiritual thoughts and emotions, even struggles, about God and his relationship with Him. I found many of the poems I read to be moving, uplifting, and thought-provoking. (You can view several of George Herbert’s poems here.) Herbert explores the deep subjects of love, death, sin, grief, and worship artistically yet simply. Herbert’s poems could prove to be challenging to the non-religious reader, but to a Christian, they speak to the heart and draw the mind toward God and His attributes. Reading Herbert’s poems is almost like reading some of the Psalms; they generate thoughts of humble repentance and submission, praise, and worship toward God. In this poem, it appears he is fighting the temptation to embellish the truths of God that he wishes to express. His goal is to write creatively, but he doesn’t want his artistry to inhibit or distract from the messages he wants to convey. Notice he says, “as if it were to sell” – he’s not trying to impress anyone or intending to market his work. This sounds as if he is writing from his heart, but not for the purpose of gaining wealth or fame. Herbert was a religious man who was also a talented poet, and it seems he took both roles seriously – why not merge the two? Herbert believed that his talent for poetry was a gift from God, and he wanted his work to give honor to God without bringing praise to himself. In “Providence,” he states that it is man’s duty to praise God and to tell of His deeds. He says that God’s other creatures would willingly speak or write of God’s greatness, if they could, but Man is the only one to whom God gave the ability to do so. He goes on to explain that when anyone fails to praise God, it is a great sin because he is “robbing a thousand” who would willingly praise Him if they knew Him. +++++++++++++++And after death for cures. +++++++++++++++It be as short as yours. Since by the cutting he grows better. Beyond the utmost stars and poles. The idea that life is like a journey is a common Puritan metaphor; Anne Bradstreet used it in her poem “As Weary Pilgrim” as did Bunyan in Pilgrim’s Progress. Likewise Herbert, in “The Pilgrimage” comments, “After so foul a journey, death is fair, and but a chair.” In his poem “Death”, he remarks that since the death of Christ, death has “grown fair and full of grace,/much in request, much sought for as a good.” When he writes of death, it is not with a sense of fear, but rather something that is welcomed by the Christian as a place of rest for his weary soul. Herbert’s poetry uses a great deal of imagery and metaphor. He speaks of life as a journey; of man as a window, a flower in a garden, or a building; of a heart as an altar. One that I really like is the sonnet entitled “Prayer 1,” which is a list of metaphorical phrases that describe what prayer is and what it means. “Redemption” is also metaphorical, being an allegory that depicts Christ’s death for his people. I suggest that as you read Herbert’s poems, look for his use of symbols and metaphors. They are very effective in making an idea stick in your mind. 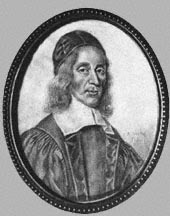 George Herbert’s single volume of religious poetry, The Temple, was published posthumously. On his deathbed, Herbert left his manuscript in the possession of a fellow clergyman, requesting that he have his poems published if he believed they would “turn to the advantage of any dejected poor soul,” but if not, to burn them. I think this shows what his motive and purpose was for writing his poetry. He wasn’t aspiring to become famous, or hoping to get rich by publishing his works. He wrote with sincerity the things that were on his heart and suspected that perhaps there were others who may be comforted or strengthened in their faith by reading them. I highly recommend the poetry of George Herbert to the Christian reader for its beauty and its content. Outside of the Psalms and hymns, it is unusual to read theological themes expressed poetically. His poems are fairly easy to understand (for poetry, that is! ), they are interesting, memorable and beautifully crafted, and they express both deep spiritual emotion and true Biblical concepts. Note: I have included the poetry of George Herbert on my list of non-fictional works I believe every Christian should read. Have you read some of George Herbert’s poems? Which is your favorite? Share your favorite lines here! This entry was posted in Christian Books, Non-Fiction, Poetry & Drama and tagged Altar, Anglican minister, Christian poems, Easter Wings, George Herbert, poetry, Puritan writers, Redemption, religious poetry, The Temple. Bookmark the permalink.